Through the pioneering program, AdaptLA, Los Angeles is developing collaborative solutions that will help the region adapt to a changing coastline. This program involves a regional coalition consisting of the 11 coastal cities, LA County, and 6 support organizations. It is viewed as a national model. 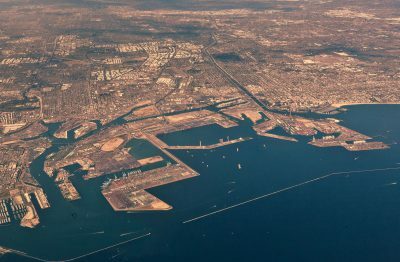 Scientists project sea levels to rise in Southern California between .4 to 1.5 feet by mid-century and up to 5.5 feet by the end of the century due to climate change. Coastal communities in Southern California are vulnerable to the impacts from rising seas. These vulnerabilities can be further exacerbated by concurrent flooding from coastal storms and extreme tides. Collaborations between researchers and local governments can ensure the best scientific data is used to inform decision-making. LA County’s coastal zone is a critical asset for the entire LA region, consisting of 11 coastal cities and a few unincorporated areas, many with convoluted and discontinuous coastal boundaries. The region’s major watersheds – LA River, Ballona Creek, Santa Monica Bay, and Dominguez Watershed – touch all of these communities and eventually flow to the Pacific Ocean (LAC 2014). LA County beaches stretch approximately 25 miles and attract more than 50 million annual visitors. 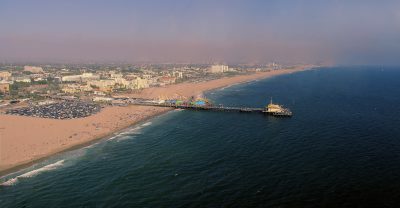 Beach-related tourism plays a major role in the region’s economy, accounting for more than $16.5 billion in expenditures in 2012 (LA County Strategic Plan 2012). The areas that make up this large region are intensely interconnected through their geographies, communities, and economies, and decisions made in one jurisdiction will undoubtedly affect its neighbors. Assist infrastructure managers to utilize modeling information provided by AdaptLA to identify infrastructure vulnerability. Examine the costs and benefits of a suite of adaptation strategies, with an emphasis on nature-based solutions, that are potentially applicable in the Santa Monica Bay. Build capacity in local communities to support adaptation planning and vulnerability assessment processes. Provide technical assistance to communities that are updating local plans to include sea level rise considerations, such as local coastal programs and general plans. Facilitate the sharing of lessons learned and best practices in incorporating sea level rise considerations into planning. Facilitate the development of a robust beach-width monitoring program that provides critical information to beach managers, public works officials, planners, and other municipal and county staff on the response of the beach to short-term seasonal and storm events, as well as to long-term sea level rise-driven beach position change. Facilitate the development of a robust cliff-monitoring program that provides critical information to beach managers, public works officials, planners, and other municipal and county staff on the vulnerability of the cliffs along the coastline. Integrate coastal climate change considerations in emergency management and hazard-mitigation planning. Train local government and community leaders on the key dimensions of social vulnerability and how to use social vulnerability assessments in emergency management, climate preparedness, and adaptation planning. Evaluate the effectiveness of coastal strand and dune ecosystem restoration and enhancement as an appropriate sea level rise adaptation strategy for coastal communities in Southern California. Facilitate the development of a robust beach-width monitoring program that provides critical information to beach managers, public works officials, planners, and other municipal and county staff on the response of the beach to short-term seasonal and storm events as well as long-term sea level rise-driven beach position change. Provide capacity-building and knowledge-sharing opportunities to showcase innovative solutions and processes to address sea level rise in the state and nationally. Identify vulnerable communities through social vulnerability analyses and conduct community workshops to validate results and develop strategies to build community resilience. Create opportunities to foster periodic, meaningful public engagement that gathers information about affected neighborhoods and communities’ concerns, vulnerabilities, and constraints. Engage community members in discussion of social vulnerability, understand its implications for their community, and help develop strategies to build community resilience. Engage students, schools, educators, and informal education institutions in community-resilience building activities. Develop materials and provide engagement opportunities in multiple languages, especially Spanish. Compile information on costs and benefits of adaptation methodologies. Develop economic indicators to help decision making on sea level rise. Engage communities in understanding the costs and benefits of coastal adaptation methods. Evaluate the impacts of sea level rise to coastal habitats (i.e. lagoons, estuaries, marshes, and rocky intertidal zones) and freshwater aquifers, and provide recommendations for conservation, restoration, and governance strategies to build resilience of these critical resources. Identify the vulnerabilities and adaptation potential for tidal marshes in Southern California under projected sea level rise scenarios, and identify opportunities for conservation and restoration. Promote and sustain ongoing monitoring programs for ocean health indicators. Better understand the biological impacts of regional ocean change. Prioritize and maintain sustainable fisheries and healthy ecosystems. Evaluate effectiveness of public alert systems for ocean health indicators. Reinforce public awareness of MPA function and regulations to aid in enforcement and stakeholder participation. Develop and foster a watershed-level hydrological community of practice that includes all actors that regulate and manage local water resources. This COP will be comprised of storm-, waste-, and potable water managers and regulators as well as coastal managers.